Fighting Fantasy Fest 2 2017 - May it's STAMINA Never Fail! 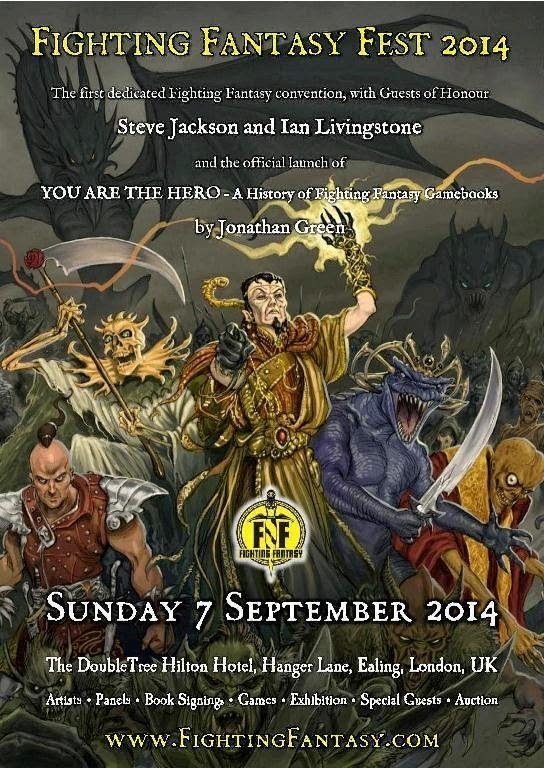 Fighting Fantasy Fest returns to Ealing for the largest dedicated Fighting Fantasy convention yet, featuring Guests of Honour Steve Jackson and Ian Livingstone, as well as a host of other guests. Fighting Fantasy Fest 2 will feature talks, gaming sessions, comics, signings, a Fighting Fantasy exhibition, and a trading hall, as well as a cosplay competition. You may also pre-order a separate Adventurer's Backpack, at an additional cost of £25, containing unique merchandise, such as a Fighting Fantasy Fest 2 lanyard and event-exclusive t-shirt. Please note that there will not be any ticket sales on the day. The website is back up and operational! With copies of issue 11 in printed form winging their way out the door, I've updated the website with PayPal buttons to make ordering a copy easier! Payment is via PayPal. Pay to alexballingallnz@gmail.com and don't forget to included the postal address where you would like the magazine sent. If you want to order more than one copy, get in touch with me about postage costs. Time for an update in the print situation! 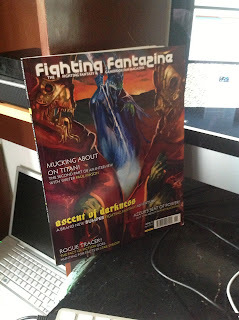 We reached the 20 physical copies wanted to go ahead with an order (@ US$17 per issue). BUT! If I order 50 copies they'll drop to US$11 per issue and if I order 100 copies it drops even further to $US9!! All would need P&P added to the cost to cover packaging & postage. So I need expressions of interest to gauge whether or not I should risk a print run of 50 or even 100 copies. Get in touch other wise it won't happen! We've been investigating the possibility of print copies of the magazine. Here's how it breaks down. The magazine will be offered via print-on-demand website MagCloud. This means that if you buy an issue it'll cost you approx. US$23 plus postage and packaging. That said, as the publishers we can do a bulk order of at least 20 copies of an issue which would result in a price of US$17 (plus P&P). When a new issue is released (or a back issue made ready for printing) we'll ask for people who'd like to join the bulk order at the cheaper price (with a deadline to joining). After that bulk order, anybody wanting a copy will have to order it via MagCloud for the higher price. just a quick line from myself to let the interweb know that the magazine is still a going concern. In fact, issue #11 is getting on to 3/4 done and I still aim to have it out late March/early April if everything goes according to plan. Will post the cover and contents soonish! 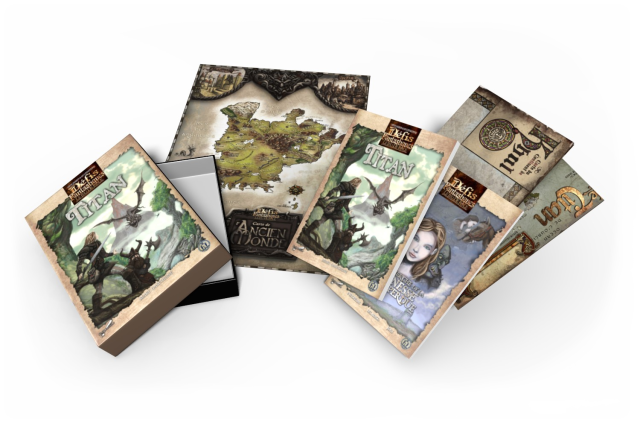 *The mini adventure Hand of Fate by Kieran Coghlan and illustrated by Robertson Sondoh Jr.
*"The Arcane Archive" reviews Blood of the Zombies, Crown of Kings - The Sorcery! Campaign for AFF and TrollsZine! issue #5. *Dan Satherley's column looks at Temple of Terror. 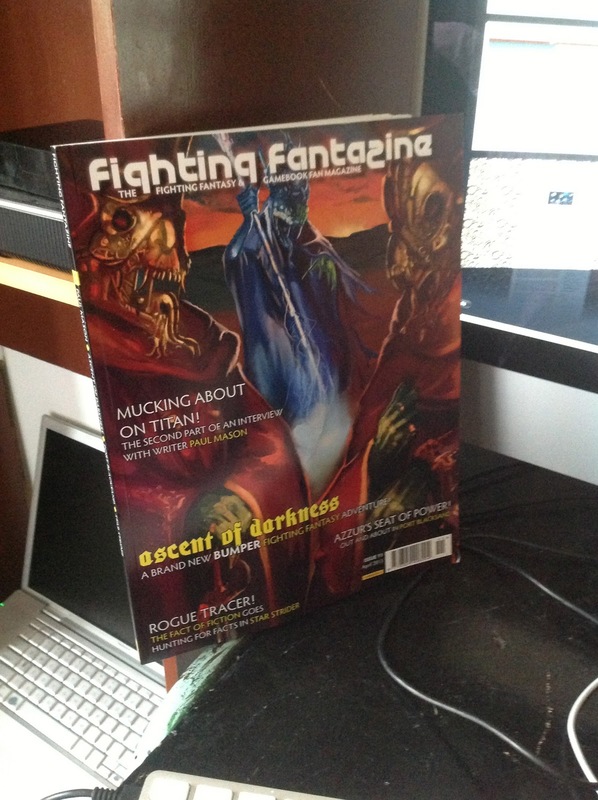 *Jamie Fry ("The Warlock" of the official site) rounds up events in the Fighting Fantasy world from his perspective. Dan Satherley's column looks for a win with Appointment with F.E.A.R. Apart from the current lack of an artist to illustrate the mini adventure (if either you or someone you know might be able to help with this problem by volunteering to do the black and white artwork please contact me), the rest of issue #7 is well on the way to being completed. So what can be found in the next issue? How soon this issue surfaces will probably depend on how soon I can find someone to illustrate the mini adventure and how quickly they can deliver the art. I've had a query about deadlines, which ties in nicely with an email I sent out to previous/current contributors at the end of last week. Basically what I was trying to communicate was, if you have something to submit (or an idea you want to thrash out as a possible submission), then getting it in to me sooner rather than later is better. The reason for this is that I am trying to block out (assign space in other words) future issues and if you want something to appear in one of those issues now is the time to send it on in! These don't mean you should have your first draft in to me by then. Ideally those dates represent when final drafts should be reaching my mailbox. Enough said, I think. If on the other hand you think I've forgotten to address something to do with deadlines and/or submissions to the mag, write a comment below! Well, what else do we have lined up for issue #6? We have "Turn to Paragraph 400" Part 2, the second half of the 2010 survey results. Find out who was voted favourite author and favourite artist. 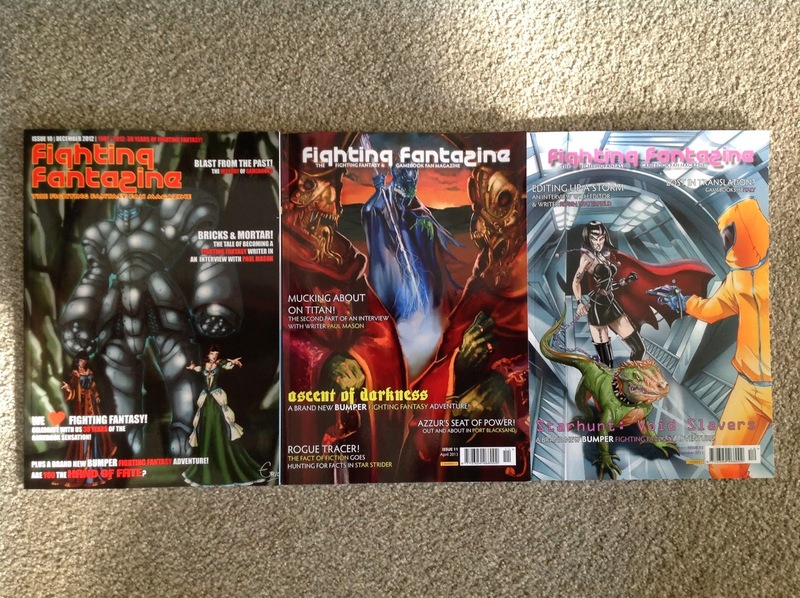 Which book would you most like to see reprinted and who would you want to pen a new Fighting Fantasy adventure? Plus, who did YOU vote as the most important contributor to the series? We also have Chapter 2 of Ian Brocklehurst's ongoing tale Aelous Raven and the Wrath of the Sea-Witch, Part 4 of Ed Jolley's continued investigation of the books for morals in "Everything I Need to Know I Learnt from Reading Fighting Fantasy Gamebooks", the "Chronicle of Heroes" by Adrian Young covers A Shadow Over Blacksand, and "Fighting Dantasy" gets to grips with Forest of Doom. Forest of Doom is also reviewed in the new reviews section, "The Arcane Archive", alongside Curse of the Mummy, Armies of Death, and Appointment with F.E.A.R. 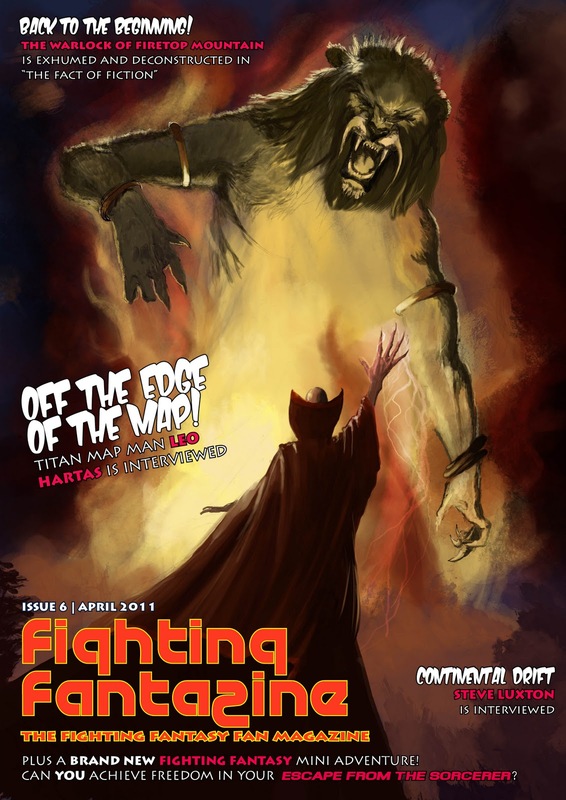 Ian Brocklehurst appears again to kick off a new irregular column called "The Magic Quest" which deals with memories of how people became fans of the series, Andrew Wright wrangles some more monsters in a new edition of "Out of the Pit", Guillermo Paredes rounds up the latest Fighting Fantasy and gamebook news, Jamie Fry looks at gamebook hunting in his column "Fighting Fantasy Collector", and the new letters page kicks off.